Could a United Nations peacekeeping mission face al-Qaeda’s fighters in Darfur? According to Osama bin Laden, if a UN force deploys in the region, al-Qaeda will attack UN troops. On April 23, al-Jazeera television broadcast a bin Laden audiotape in which he called for al-Qaeda fighters to begin traveling to Darfur to prepare for a “long-term war against the Crusaders,” an apparent reference to the UN force (controlled by the United States in bin Laden’s mind) that could replace the ineffective African Union mission in the region. The commander of the United Nations Mission in Sudan has announced that the UN force is treating Bin Laden’s threat with “whole seriousness” (Sudan Tribune, April 26). The Sudanese government is doing everything possible to prevent a large-scale UN deployment in Darfur, but this sudden offer of al-Qaeda assistance is surely unwelcome in Khartoum. 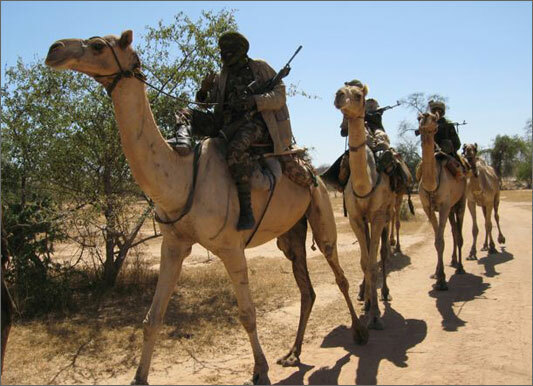 With desertification sterilizing the traditional grazing lands of the Darfur nomads who supply the bulk of Janjaweed manpower, it will prove nearly impossible to cast the militias and their families back into the desert, regardless of their crimes. Some Janjaweed leaders (like Sheikh Musa Hilal) are already appealing for peace in the interests of consolidating their gains. In the meantime, discipline is breaking down in the African Union force, which has not been paid in two months (Daily Trust, Abuja, May 8). The commander of the AU troops, Major General Collins Ihekire, has called for a quick deployment of UN troops to reinforce the AU mission, whose mandate has been extended until the end of September (IRIN, May 9).